Blue Raster is pleased to announce a partnership with Resources for the Future, a nonprofit and nonpartisan organization that conducts research on environmental, energy, natural resource and public health issues, to create an interactive mapping tool that will track and present the effects of climate change on populations around the world. The application, created using ArcGIS Server 9.3.1 and Flex API, allows users to track historical environmental patterns around the world, as well as to predict the consequences on regions of various hypothetical scenarios, which could include factors of pollution control, energy and transportation policy, land and water use, hazardous waste disposal, climate change, biodiversity and ecosystem management, public health, and environmental challenges in developing countries. We hope that this user-friendly tool will help generate support for Resources for the Future’s goals of improving environmental and natural resource policymaking worldwide. 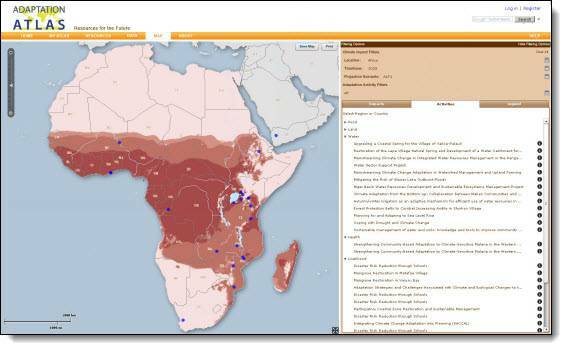 For more information regarding Adaption Atlas please visit http://www.adaptationatlas.org/.